Fogging tester Fogging test equipment for the Automotive Industry according to ISO, DIN, ASTM, VOLVO, etc. 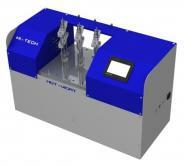 HDT Vicat Tester The HDT-Vicat Tester has been designed for simple and independent control of plastics. Hot set tester, cable sheat test This Hot Set Tester offers standard conditions for performing hot set tests on cable material according to IEC 811-2-1. Melt index, tests Meets various standards for determination of the Melt Flow Rate and the Melt Volume Rate of thermoplastic materials. Retratech, shrinkage film tester Retratech, characterization of shrinkage films, load, retraction rate and temperature. Tube Oven Tube oven for determination of carbon black and ash content in polymers.